10% Student Discount at Pretty Green Students looking for cool and edgy clothing get a tempting 10% discount on orders at Pretty Green. Free Returns on Orders at Pretty Green Changed your mind, or aren't completely satisfied with your order? You can send it back to Pretty Green at no extra cost. Accessories from £10 at Pretty Green The perfect accessories are just a click away and for a great price at Pretty Green. Free Delivery on Orders Over £80 at Pretty Green No need to worry about delivery, its free on orders over £80 at Pretty Green. Footwear from just £20 at Pretty Green Classic, high-quality shoes and in the latest styles, all now available at Pretty Green. Jeans from £75 at Pretty Green Get the latest denim at Pretty Green. 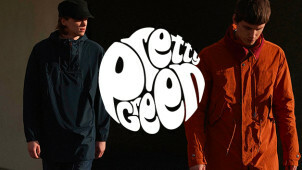 Polo Shirts from £40 at Pretty Green Great polo shirts from just £40 at Pretty Green. Free Click and Collect on Orders at Pretty Green Now you can order online and get it delivered to store for free! Pretty Green was launched to much fanfare in 2009, when Liam Gallagher announced that he wanted to branch into fashion as well as his music projects. Already known for his cool and indie style, a look that came to life with influences from the '60s and '70s - people were more than excited to see what Gallagher's brand would offer - and it's safe to say that he delivered. With the aim of creating the clothes that he wanted to see more of rather than giving into skinny jeans and pointed shoes - now, Pretty Green is a favourite with fashionable men all over the UK and in other parts of the world too. With an extensive catalogue of shirts, polos, knitwear and more - here you can sort your wardrobe out from day to night. For simple and intricate prints too, find everything from smart mod inspired blazers through to relaxed sportswear. Everything from Pretty Green has something to say, so if you want to add more rock star style and substance to your look, you have come to the right place. With a homeware and an accessories section too, Pretty Green is also a great place for gifts, so you can find jazzy yet quaint umbrellas, fun mugs, mobile phone cases, suave wallets and much more from Pretty Green. How do I use my Pretty Green discount code? Other discounts which don't require a code will be automatically applied to your final bill. Get yourself onto the mailing list to get new releases, exclusive discounts and more sent straight to your inbox. Does Pretty Green offer student discount? You can get a 10% discount instore with a valid student ID card. There are often special instore promotions too where you can increase your student discount to 20%. Does Pretty Green offer gift cards? You can buy both physical and electronic gift cards from Pretty Green online by simply adding them to your cart as you would with any other purchase. Email: customercare@prettygreen.com or use the contact form. With Pretty Green you’ll get rock 'n' roll inspired menswear with a cool retro twist, courtesy of Liam Gallagher himself. Pretty Green has become a hugely popular men’s fashion brand since its launch in 2009, and now you can discover it for less using a Pretty Green discount code to save on a world of great clothing. For your everyday looks, and for when you want to scrub up too - pretty green is the perfect place to find your casual, classic attire and more. How Do I Use My Pretty Green Discount Voucher? The brand name Pretty Green is taken from a song by The Jam, who heavily influenced Liam Gallagher both in terms of music and fashion. You can see the influence of Paul Weller, The Jam's iconic frontman, in some of the clothing and accessories Pretty Green design. In the song, the term 'Pretty Green' refers to cash. The cool clothing and accessories stocked at Pretty Green are heavily inspired by Liam Gallagher's own iconic style, so think classic trenches and parka jackets that are a huge part of Liam's laid back yet yet sharp look. Shop outerwear for less with a Pretty Green promo code and invest in a look from the heyday of Oasis back in the '90s. This is one look that will never go out of fashion, so for a true cult classic - go Pretty Green and add some Manchester Britpop flair to your wardrobe. This offer has limited uses per person. Please login or join free to redeem.